Anxious parents saddled their children with oversized shoulder pads and helmets as a Zamboni readied the ice rink in anticipation for a youth hockey clinic at the Salvation Army’s Kroc Center Ice Arena. 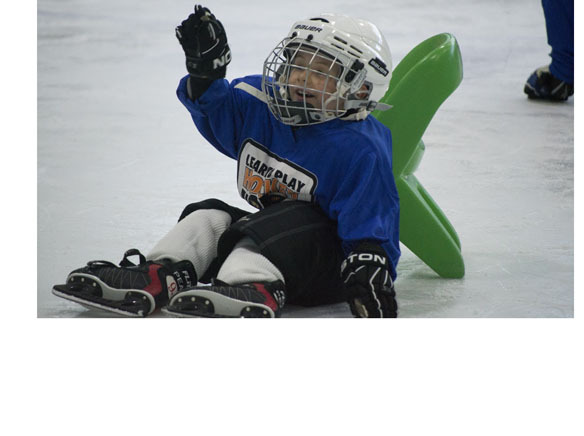 Taking part in the Anaheim Duck sponsored Learn to Play program, 60 children took the ice, many for the first time, aided by a host of helpful coaches and orange safety buckets used as a crutch to keep the more novice skaters upright. The Learn to Play program, whose third week resumes Saturday, is a four week crash course in hockey fundamentals for children ages 4-12. Over the four weeks the participants will learn a variety of skills including how to skate, handling a hockey stick, and shooting a puck. Many would-be youth hockey players are deterred by the high price of entry that comes from purchasing costly hockey equipment. The program was created to offer first-time players the chance to get on the rink in full hockey equipment for free. Anaheim Duck stars Corey Perry and Ryan Getzalf have pledged to give every kid who completes the program a brand new set of hockey equipment. The rink was quite a spectacle as 60 children all took the ice at the same time eager to become acquainted with their skates and equipment. It resembled an adolescent boot camp as children sprawled out all over the ice labored to get to their feet, with the help of their trusty bucket, to receive more instruction from coaches. Often time’s exhausted or frustrated children would take a breather on the bench before returning to the rink. Volunteer coach Bart Roberson, said he was pleased that on this day no man was left behind. If the chorus of camera phones recording the proceedings and the hand-smudged class surrounding the rink were any indication, the parents enjoyed it as much as their children. Jim Fee, father of Jacob Fee who was taking part in the clinic, said his son has been waiting for an opportunity like this. “We are a big hockey family, this is his first time ever though. It’s hysterical he can’t stay up today,” he said. Mark Campbell another ebullient parent looking on said he was happy he heard about the program. The program is open to everybody and has no restrictions. The maximum number of kids per clinic is 60, but Chatfield said parents should sign up anyway.